The New Hampshire Seacoast city of Portsmouth ignited my passion for photography and makes up one of my largest bodies of work. Having built and grown a company in this city for over 25 years, Portsmouth has literally shaped me personally and professionally. 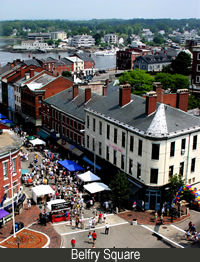 For me, Portsmouth is a wonderful anomaly in New Hampshire . It offers a microcosm of a big-city culture – without the congestion or haughtiness. Shaped by a blue collar working class, Portsmouth has fortunately avoided a wholesale gentrification as the city's look and feel transforms. It's a walkable community with tremendous architectural diversity. I'm hypnotized by its history, dating back to 1603 when Martin Pring first sailed up the Piscataqua, a river that frames Portsmouth 's photographic appeal. It's amazing how new images appear every day, around corners I've seen a thousand times, urging exploration.